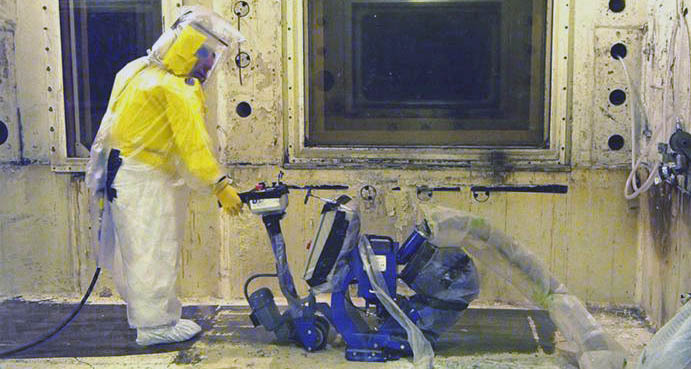 Nuclear decommissioning is the dismantling and decontamination of an old nuclear activity: power plant, laboratory or industrial nuclear site that no longer requires measures for radiation protection. The characteristic difference between the dismantling of other power plants is the presence of radioactive material that requires special precautions. Generally speaking, nuclear buildings were designed for a life span of about 30–40 years. Once they come to the end of their operating life, these plants must be decontaminated to remove every radioactive contaminant. The main goal is to remove as much of the contaminated materials as possible, in order to give back a safe area to the public sector. Decommissioning involves many administrative and technical actions. It includes clean-up of radioactivity and progressive demolition of the plant. Once a facility is decommissioned, there should no longer be any danger of a radioactive accident or any dangers to those visiting it. After a facility has been completely decommissioned, it is then released from regulatory control, and the licensee of the plant will no longer be responsible for its nuclear safety. As a minimum, the floor, walls, and external structural surfaces within work areas should be cleaned of loose contamination. It's a slow, expensive and essential process taking place in stages due to the radioactivity in the reactor structure. A decontamination program may also require a facility capable of treating secondary waste from decontamination. The concentrated waste, representing a more significant radiation source, must be shipped for disposal in licensed disposal facilities. Working width: Ø180 mm | The Blastrac BG-180EC grinder is specifically designed for edge and corner grinding and polishing applications. Working width: Ø250 mm | The BGS-250 has an adjustable grinding depth and it's very easy and comfortable to use with low vibrations. Working width: Ø250 mm | The BG-250E is a heavy duty electric single-disc grinding machine and is very easy to transport due to the lifting handles and lifting eye. Working width: Ø250 mm | Similar to the BG-250E, the BG-250P is a petrol powered heavy duty single-disc grinding machine with a strong and powerful buffer system. The machine is equipped with a special system of vacuum measurement and the machine will automatically stop when the vacuum is too low. The BGV-180AV is a hand held grinder equipped with a standard Ø180 mm diamond cup wheel. It's comfortable to use and ideal for professionals. The SUPRAFLEX is suitable for small grinding and polishing projects. It is standard equiped with speed control. The BHG-1800-1 is a handheld grinder equipped with standard cup wheel Ø125 mm. It's ideal for professional contractors, yet versatile enough for home use. Working width: Ø735 mm | The BMG-735PRO is a triple head grinder with 3 x Ø240 mm discs. It has a powerfull motor and a solid all metal construction to create the ideal weight. Working width: Ø780 mm | The BMG-780PRO is a triple head grinder with 3, Ø240 mm planetary rotating discs. It's an user friendly machine and comfortable to use with low vibration. The Blastrac BDC-15KW dust collection system is composed of 3 units and is ideal for working with hazardous materials such as asbestos or lead paint. The Blastrac BDC-138H is a heavy duty dust collection system ideal for working with hazardous materials such as asbestos or lead paint. The Blastrac BDC-138H SPLIT is a dust collection system composed of 3 units: the filter unit & the safety filter unit box, both equipped with HEPA filter and the suction unit. The Blastrac BDC-3160H is a heavy duty dust collection system completely HEPA certified which makes it perfect for hazardous materials and jobsites. The BDC-3160H SPLIT has a double absolute filtration (HEPA filters in the filter unit and the safety filter unit) which makes it perfect for hazardous materials and jobsites. The Small Size Cyclonic Pre-Separator increases the lifetime of the dust collector filters and captures 80-90% of dust. It is specially designed for jobs with a lot of dust. The Large Size Cyclonic Pre-Separator can treble the filters lifetime of the dust collector and captures 80-90% of dust. It also increases the suction performance. The Blastrac 1-7D shot blast machine is perfect for smaller sized jobs. Its versatility and maneuverability makes the 1-7D easy to operate and transport. The Blastrac 1-8DPS30 shot blasting machine, equipped with an electric drive system, is perfect for small to medium-sized jobs. The 1-8DPF40 is a lightweight and portable walk behind blast-cleaning machine perfect for small to medium-sized jobs. The Blastrac 1-8DPS55 shot blasting machine is a motorized drive blast-cleaning machine of high quality and strong fabrication. The 1-10DS is a highly versatile machine. Its heavy duty blasting ability makes it ideal for applications such as airport maintenance and asphalt cleaning. The 1-15DS is shot blasting machine of high quality and strong fabrication. It owns a height adjusting system for an easy transport. This floor stripper is a powerful self-propelled machine, ideal for indoor and outdoor medium sized renovation jobs. The Blastrac BMS-220ADB is a ride-on stripper with the added benefit of being battery operated for increased versatility.